James Kleinmann sits down with Hollywood legend Clint Eastwood and his cast Dianne Wiest, Alison Eastwood, Michael Peña (from Narcos Mexico – here as another DEA agent), American Horror Story’s Taissa Farmiga to talk about their new movie The Mule, which is also directed by Clint Eastwood and also stars Bradley Cooper, Andy Garcia and Laurence Fishburne. Clint Eastwood talks about preparing for his return to a role in front of the camera, and why it made sense for him to play this character. 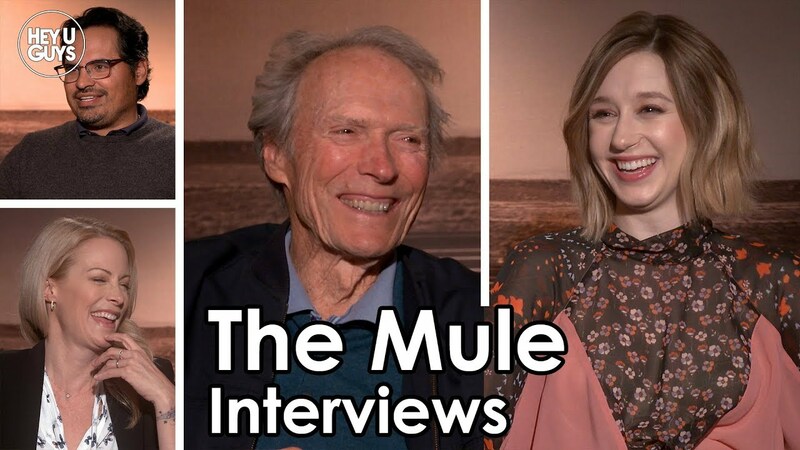 Alison Eastwood and Taissa Farmiga talk about the fact that this was based on real events, and how the unlikely story is brought to life on the big screen. Michael Pena talks about playing opposite Bradley Cooper in a Clint Eastwood film, and how important his sense of humour was in that role. Eastwood also talks about the inspiration he gained for the role and the story from his Grandfather, and how the role of family is integral to the film. His daughter talks about how her father runs his set, and how free he is with his actors. The Mule is out in cinemas on the 25th of January.